The location of a piece of possible debris from Malaysia Airlines Flight MH370 is consistent with theories about where the wreckage may lie, Australia's transport minister said Thursday as victims' families called for a full search of the east African coast. 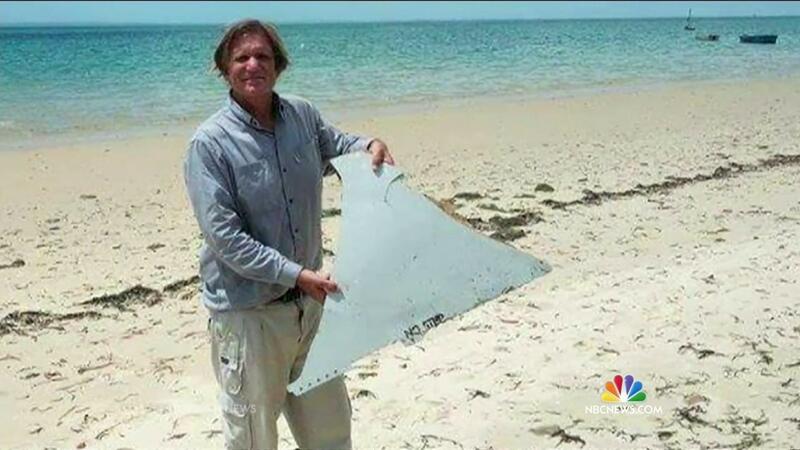 The metal fragment, which could be part of the missing Boeing 777's horizontal stabilizer, was found by American adventurer Blaine Gibson in a sandbank off Mozambique. It was being taken to Australia where it will be examined by international specialists and officials from Malaysia. Early photographic analysis of the 11.7 inch-by-16 inch object suggests it could have come from the jetliner. The discovery was first reported by NBC News on Wednesday. Gibson, who is from Seattle but who is attempting to visit every country in the world, has blogged extensively about the search for MH370. He told NBC station KING 5 that he'd chartered a boat while visiting Mozambique to take him to a remote sandbar where a lot of debris tends to wash ashore. Gibson said he'd made similar searches in other locations without any success. "I urge everybody to be cautious and to not just jump to the conclusion that it's from MH370," he told the station. "Wait until the professionals make the determination." The Boeing 777 vanished almost exactly two years ago en route from Kuala Lumpur to Beijing with 239 people aboard and is thought to have crashed into the southern Indian Ocean. "The location of the debris is consistent with drift modelling commissioned by the Australian Transport Safety Bureau (ATSB) and reaffirms the search area for MH370," Australian Transport Minister Darren Chester said in a statement. He later told reporters that the object was "of interest to us" but it was "way too early" to confirm if it was anything to do with MH370. Malaysian Transport Minister Liow Tiong Lai said Wednesday on Twitter that there was a "high possibility debris found in Mozambique belongs to" a Boeing 777, but he said that was "yet to be confirmed and verified." The object has the words "NO STEP" on it and could be from the plane's horizontal stabilizer — the wing-like parts attached to the tail. It was discovered by an American who has been blogging about the search for MH370. If was found in the Mozambique Channel between Mozambique and Madagascar, the same corner of the southern Indian Ocean where the only confirmed piece of debris, a flaperon, was found last July. The latest discovery prompted the support group for relatives of those on board to call for the coastlines of Mozambique and Madagascar to be "scoured thoroughly." "We urge states with assets in the East Coast of Africa to support such an effort," Voice370 said in a statement. "We also seek support from naval powers to supply search assets that allow searches closer to uninhabited or swampy portions of the coast be searched effectively." The development comes days ahead of the second anniversary of the jet's disappearance on March 8, 2014. Almost three-quarters of an internationally set 46,000-square-mile search zone has been covered so far in the hunt for the missing airliner -- an area of ocean floor larger than the state of South Carolina. The operation is due to be completed by the middle of this year. The Joint Agency Coordination Center says that if no "credible new information" about the jet's location emerges, the search will end.